Render a points transfer form. This shortcode accepts different attributes based on the transfer_type attribute value. points_type – The points type to transfer. Accepts: any slug of any points type registered. recipient_id – User that will receive the transfer. 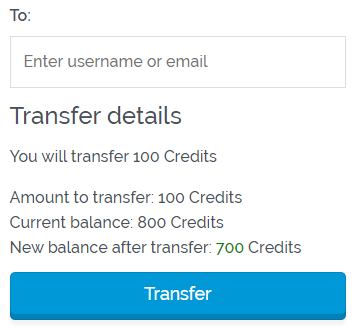 User will see a points transfer form with the configured amount (without possibility to change it). 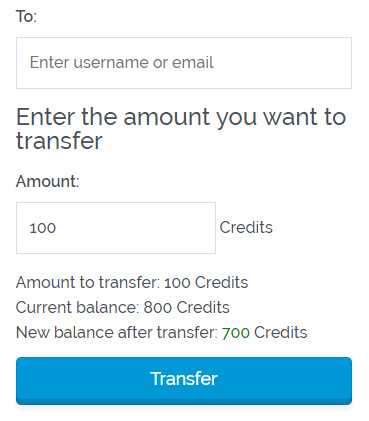 User will see a points transfer form where he can configure the desired amount of points to transfer. 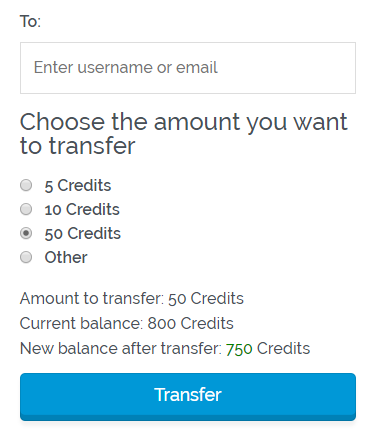 Every time user changes the amount, the points balances at the end of the form will change without refresh the page. User will see a points transfer form where he can choose an amount of points to transfer from a group of predefined options. If you set the attribute allow_user_input to yes, then a new option will be shown to let to the user enter a custom amount (like custom amount form). options – Options available to transfer. initial_amount – Set the initial amount if allow_user_input is set to yes.